St. Martin de Porres was born in Lima, Peru in 1579, shortly after the city was founded. His father, Juan de Porres, was a Spanish soldier and nobleman born in Burgos, Spain. He came to the “new world” as Governor of Panama. Martin’s mother, Anna Velázquez was a black freedwoman from Panama. There was no question of marriage because Anna’s skin was black. Apprenticed as a barber-doctor at age 12, he entered the Dominican Order a few years later as a lay brother. In 1603 Martin made his vows as a full-fledged Dominican Brother, with the vocation of prayer and work. Advancing quickly to the highest level of spirituality (it is believed by 20 years of age); he passed the remainder of his life in complete dedication to his order and to the cause of the poor and sick of Lima. St. Martin de Porres is famous for his miracles, which include multiplying food to help feed the monks and the poor. Many miracles of healing were attributed to his intercession. St. Martin did extreme penance and spent long hours in prayer. The life of St. Martin de Porres is explanation enough why he is so powerful with God and such a certain helper in time of need. He died in November 1639, a few days short of his sixtieth birthday. The highest dignitaries, both civil and religious, were his pallbearers. Everyone wanted to honor this holy man. The whole city of Lima mourned its benefactor and friend. 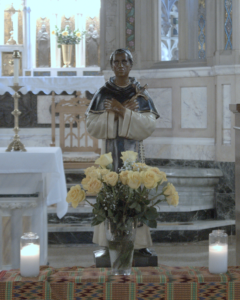 The appeal of St. Martin de Porres is universal. Called an apostle of charity; patron of social justice; father of the sick and the poor; wonder worker of Peru; and helper in hopeless cases, he is powerful intercessor to those in need. In 1962, His Holiness, Pope John XXIII presented him to the world as the Saint of Universal Brotherhood. Holy Mother Church celebrates the feast of St. Martin de Porres on November 3. He is the first person of color to be canonized in the Western Hemisphere.